Chapman University Fowler School of Law is located on the beautiful Chapman University campus in the heart of Orange County, California. The campus is near many great attractions such as the world famous Disneyland Resort, Angel Stadium, and a number of iconic beaches. According to the National Jurist magazine, Orange County is home to some of "the Best Cities for Young Attorneys." It is not surprising that students seeking a great California law school increasingly choose Orange County as a destination for their legal studies. Commonly referred to as “The Orange Circle," Old Town Orange is a one square-mile area that is centered on the historic Orange Plaza, considered the heart of the City of Orange. Just two blocks from the Chapman University campus, the Circle has a variety of gourmet and casual eateries, popular taverns, well-traveled antique shops, and other specialty stores. Old Town Orange is the largest historic district in California and has many structures listed on the National Registry of Historic Places. 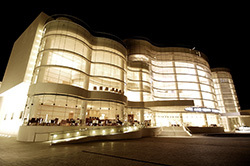 It is ranked by CBS Los Angeles as among the Best Old Towns to Walk and Shop in Orange County. Orange County's beaches are simply breathtaking. 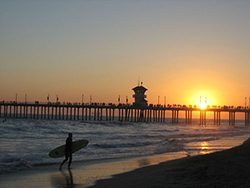 Chapman University is near Huntington Beach (Surf City), Newport Beach, and Laguna Beach. The world famous Disneyland Park is a theme park located in Anaheim, California, owned and operated by the Walt Disney Parks and Resorts division of The Walt Disney Company. It is the "happiest place on earth" and is a hub of great entertainment, attractions and dining. Visit the official Disneyland website! Best places to eat near campus!